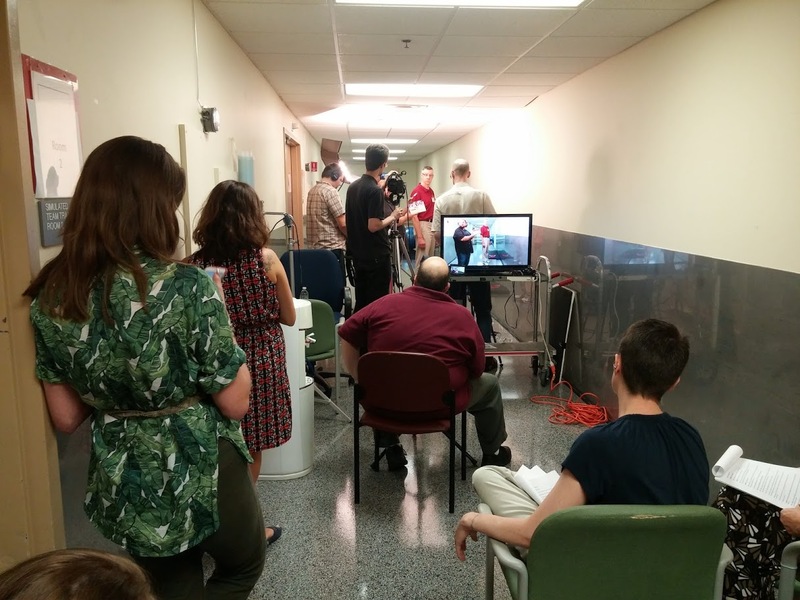 The Kates Media team, along with Kate Crowley (near left, Digital Publishing Project Manager) and Liz Schaeffer (seated right, freelance developmental editor and shoot supervisor) monitor a physical therapy scene. I’m actually watching a team from Kate’s Media filming several videos to accompany a new edition of our book, Diseases of the Human Body, by Carol Tamparo. 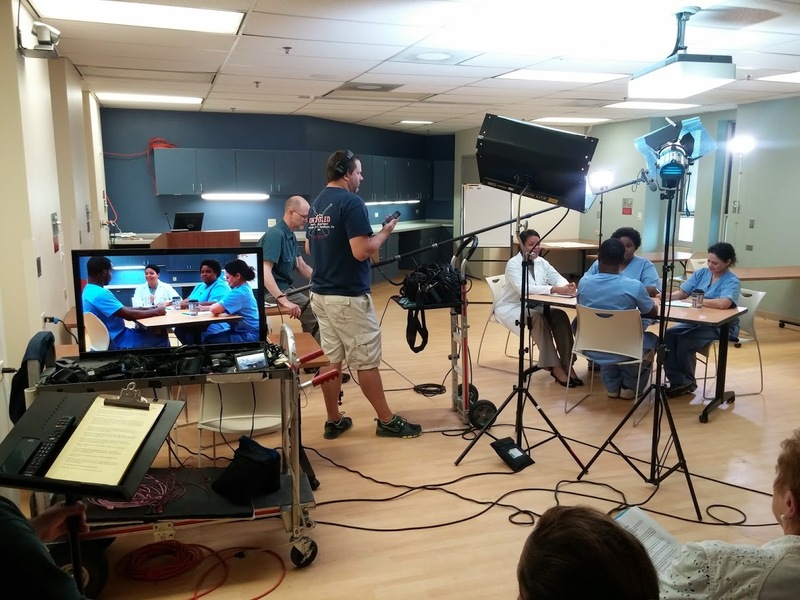 We were shooting scenes at the University of Pennsylvania Simulation Center in Philadelphia. The videos are designed to show health professions students how to interact with patients, physicians, and other members of the health care team. Actors floated in and out of scenes, each knowing the role they were to play and having dressed for the part. Camera operators focused their lenses, sound technicians fine-tuned their microphones, a costume designer fit each actor with just the right uniform, and a makeup artist freshened makeup and teased hairdos just so, all in an effort to present the most professional, realistic scenarios possible. The director, Rob Kates, watched the scenes unfold from behind a monitor, speaking to his team through a portable headset, guiding the actors and quietly ensuring that each shoot proceeded smoothly. Carol Tamparo and Jenn Davis pose for the camera during shooting. 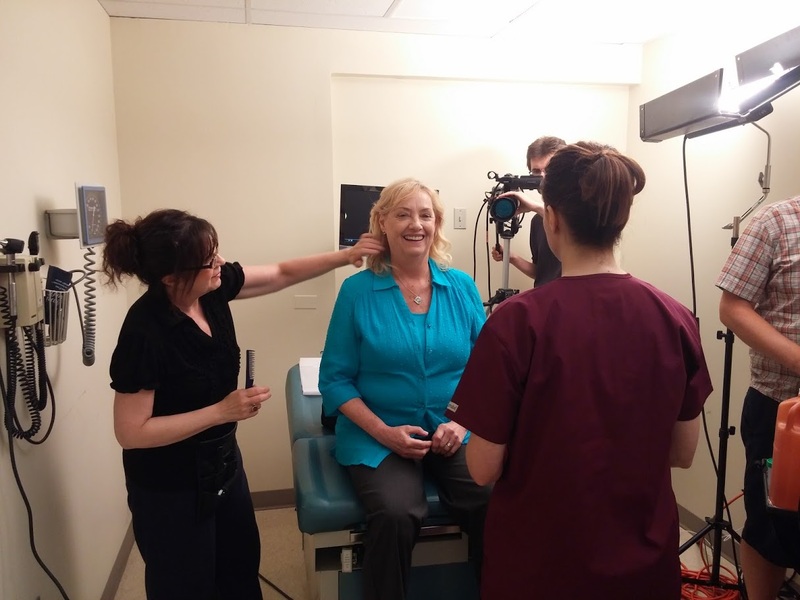 Carol Tamparo and two key collaborators, Jennifer Davis and Donna Firn, served as clinical supervisors, answering a variety of questions from the video team and making sure that all scenes were clinically accurate. 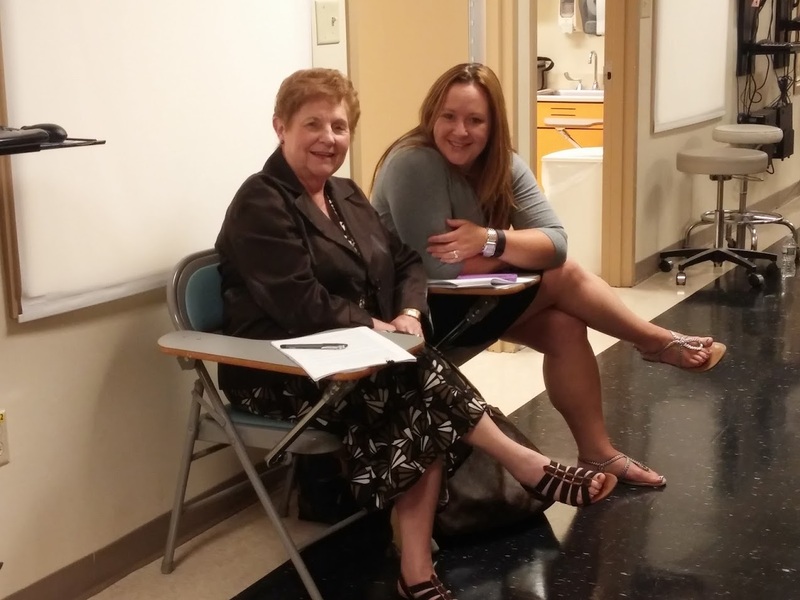 Liz Schaeffer and Liz Bales, two of our marvelous editors working on the project, served as technical advisors. They made sure that the actors understood their roles, pronounced medical terms correctly, and read their lines for optimal effect. And then there was Scott Faust, a energetic production assistant for Kates Media. Scott kept us all fed and hydrated, kept the environment quiet, and performed a host of other duties designed to keep things moving. Talk about a well-oiled machine. “Patient” Rene Goodwin receives a last-minute hair touch-up. It really does take a great team to produce great videos, and this team did it all to help students learn critical concepts. I am enormously proud of the team, and I can’t wait to see the finished videos! Oh, and by the way, an eye line is an imaginary line between an actor’s eyes and a teleprompter. If the eye line is on target, it looks like the actor isn’t reading from the teleprompter but rather just looking at another actor. A room tone is a recording of the room with no one in it making a sound. The sound engineers use those recordings to splice pieces of video together seamlessly. The things one can learn from a video shoot! Reality vs. what we see on-screen in the finished product!